Telangana DOST Registration 2019: DOST is an online portal for registration of admission in the universities of Telangana. Official notification and TS DOST application form 2019 will be issued in the month of May 2019. Interested candidates, who want to apply for TS DOST can read this article about how to fill TS DOST registration form 2019. For complete information on TS DOST 2019, candidates must go through the article provided below as we have shared all the necessary information here. Candidates will get detailed information on registration procedure, eligibility criteria, documents etc. 2 How to do Telangana DOST registration 2019? Degree Online Service Telangana (DOST) 2019 is an online service for all the students of the state seeking admission to graduate degree programs (such as B.A./B.Sc./B.Com./B.Com. (VOC)/ B.Com. (Hons)/BSW/BBA/BBM/BCA etc.) in all the six universities of the state. The universities of Telangana in which candidates are granted admission are Osmania University, Kakatiya University, Mahatma Gandhi University, Telangana University, Satavahana University, and Palamuru University. Candidates who have qualified class 12th examination and is seeking admission to an undergraduate degree course in the state have to register at DOST first. All the dates mentioned above are based on previous year schedule. The official schedule for the year 2019 will be updated soon. 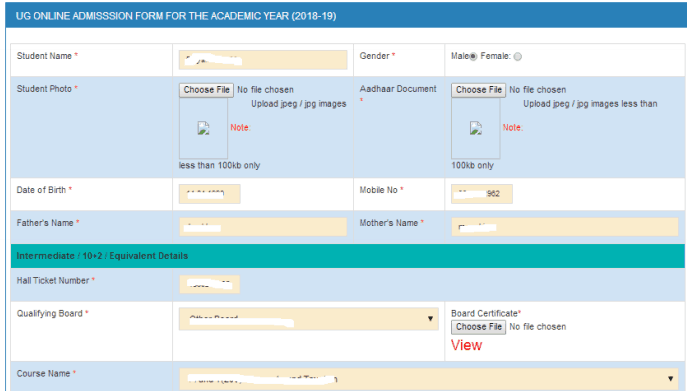 How to do Telangana DOST registration 2019? Applicants have to begin with opening the official website of DOST i.e. www.dost.cgg.gov.in. After opening the portal, the homepage will appear. On the homepage, click on “Candidate Pre-Registration” tab. Now, candidates have to enter all the details in the space provided. Once, they have filled the details they have to click on the “Click for Aadhaar Authentication” button. Candidates will now receive an OTP which they have to enter in the respective field. TS DOST Id will be generated and a success message will be displayed on the screen. Candidates have to make payment by using an online payment method and after completion of the transaction, they will receive a transaction ID. After that, they will be landed in the DOST 2019 application page. On this webpage, they have to click on “Application Details Entry”. Candidates have to click on Application Fee Payment and a payment page will appear. Candidates have to fill all the information like DOST ID, hall ticket Number, students name, mobile no. etc. and have to click on “Proceed to Payment” option. Applicants are required to fill all the details in the space provided. Here candidates have to fill education details, address details, certificate details etc. Now, applications have to fill web option. Here they have to select a university, College and other details. Candidate should review carefully all the details before submitting form. Once they have filled the application form they need to save and take a printout of TS DOST 2019 Application form submitted. Candidates have to pay a registration fee of Rs.100/-. Registration fee can be paid only through the online mode (Debit card/ Credit card / Net Banking). Applicants interested in filling application for DOST 2019 must ensure that they satisfy the eligibility criteria. A candidate found ineligible at any stage of the admission process shall be disqualified and his/her candidature will be canceled. They must have completed 10+2 with respective subjects from a recognized board. For detailed information on eligibility criteria, candidates are advised to refer the official admission guidelines of DOST 2019. Where candidates can find all the details, notifications, timetable, press release and other information issued by the DOST 2019? Ans.- You can find all the information DOST 2019 official website. What are the essential that I need to be ready with at the time of registration? You must have mobile no. linked to aadhaar card, updated name, date of birth and gender details as mentioned in the SSC/Intermediate certificate and in aadhaar card. Is a candidate who have studied in other states eligible for admission DOST 2019? Is it compulsory to have an Aadhaar no for DOST 2019? Yes, and it is also necessary to have a mobile no. seeded to Aadhaar card. Is a polytechnic pass out students eligible for DOST 2019? Can a candidate edit the application form after submitting it? Application form can be edited before the submission of web options. Candidates can edit application form before the submission of web option as many time as they want. How many colleges/ universities can a candidate select during web option? Candidates can select any no of colleges/universities as there is no maximum or minimum limit. HLCs are the Help Line Centres established to help candidates in all the matters regarding the DOST 2019 application. How can I find an HLC? The list of all the HLCs is made available on the website and you can search your nearby HLC from the list. What should I do if my application status shows pending at HLC? This may happen due to a mismatch between your aadhaar and intermediate details. For this, you have to visit your nearby HLC that will verify and scrutiny the details. After that, your application status will be changed and you will receive an SMS on your registered mobile no. For any query related to Telangana DOST Application form 2019, candidates are free to visit the nearby HLC or they can also contact us. In case candidate face any problem in registering for the TS DOST 2019 admission, they can contact us in the comment box below and our team will help in finding a solution. TS DOST 2019 is one of the most preferred method of admissions in Telangana College and universities. Therefore, we will be updating this article with any new notification and information that are essential for candidates. Hi, couldn’t able to access the provided site for all details ‘http://www.dost.cgg.gov.in/’. Mobile linked adhaar mused Sir….